I have had a look at several sources for an OB and the timing of the battle as it unfolded and have come up with the following. I used mostly Adkin's book, but also got some ideas from a monograph on the battle put out by the Napoleonic Archive. Nice little book and even has a set of rules. I have substituted some units; all the cavalry units have been substituted to allow for my collection. I have no KGL lights, so some 95th (1st KGL light) and 5/60th Rifles (2nd KGL light) have been substituted. This will also be the first time my 6pd Rocket troops will see action! I have to paint a figure to represent Col Ompteda and a couple of extra stands of the 95th, but I am pretty ready to go. The timing is pretty accurate. 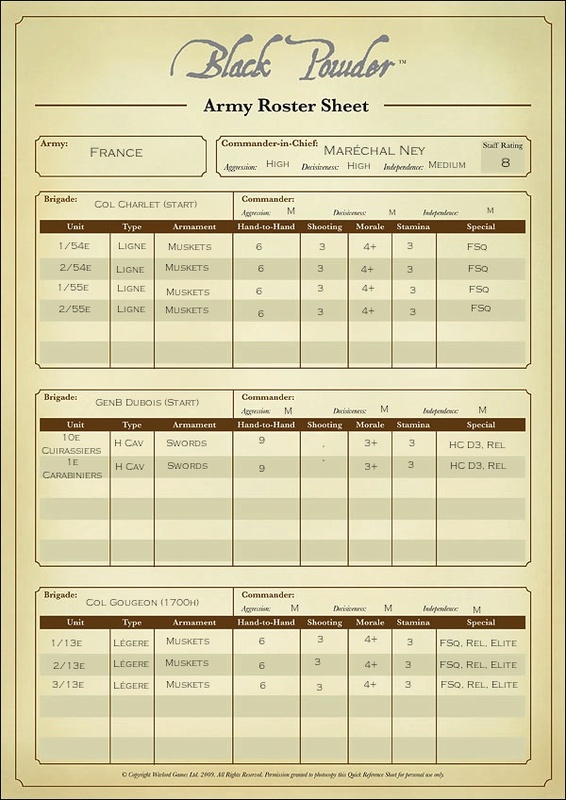 I have been working on the rating of all the units, clearly some of the Allied units will have higher ratings then the French generally, but at the same time it would be difficult to underrate the French heavy cavalry and the 13e légere. 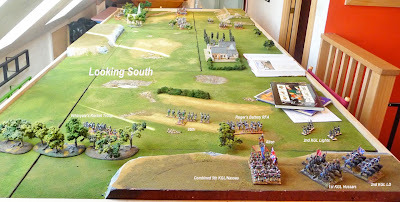 The British do have cannon and some terrain advantages, but essentially they have half the troops as the French and really most of them do not arrive until quite late in the scenario. 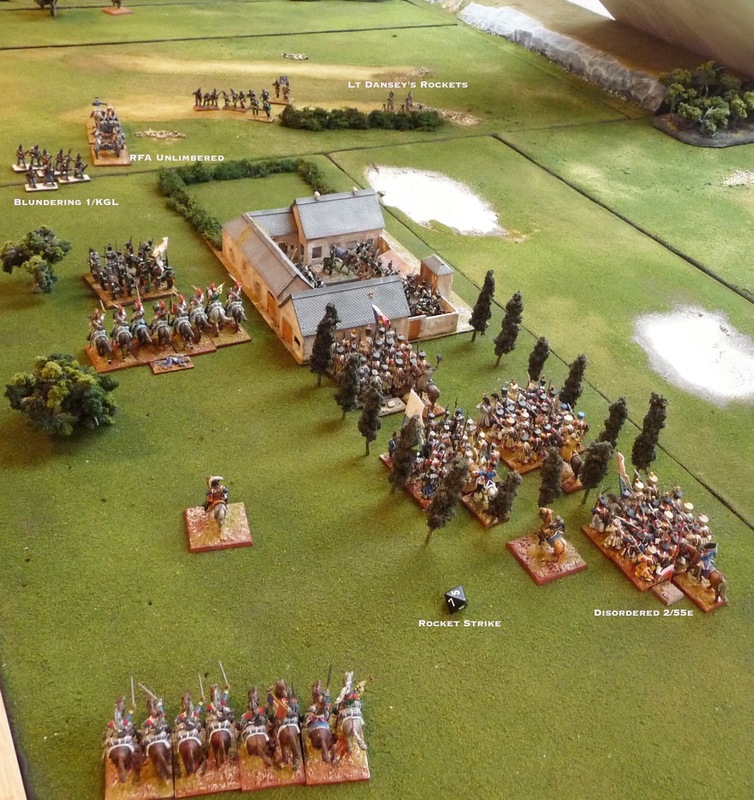 Here are the French troops, I am still playing with the initial dispositions, they will move first. The defenders at La Haie Sainte, the Hanoverians do exist, I did not realize that they were not on the table when I took the photo. Here we have the allied troops, interesting that they are all German aside from the 95th and the artillery. I may combine the Nassau with the 5th KGL line into a large unit, I am still thinking about this. A little better view of the allies, Lt Gen Alten is next to Wellington's elm. The tree line at the reverse slope, the hedge line that the 95th and Lt Dansey with his rockets used for cover as well as the famous sandpit have all been modeled in the terrain set up. The 1st KGL lights face a daunting challenge! Now for the most important part: The rules. The sharp eyed among you will note that a copy of Black Powder (BP) is lying on top of Lasalle. I have yet to use these rules but am considering them. One difficulty I have had with Lasalle in my Hougomont scenario was irregular troops, there is really not a lot of flexibility in the rules for them as skirmishing as been factored into unit characteristics. This is no problem for fixed battles, but La Haie Sainte requires the ability to add small groups of men gradually as battle progresses. I am a very inexperienced gamer, and when I am adjusting a set of rules I always feel uncomfortable. I suspect that the Republic to Empire (RtE) rules would be perfect here, but I find them a little inaccessible. I suspect if I got a chance to play with someone who knew them well, I might pick them up quickly, but I find the book as presently written a little unclear. 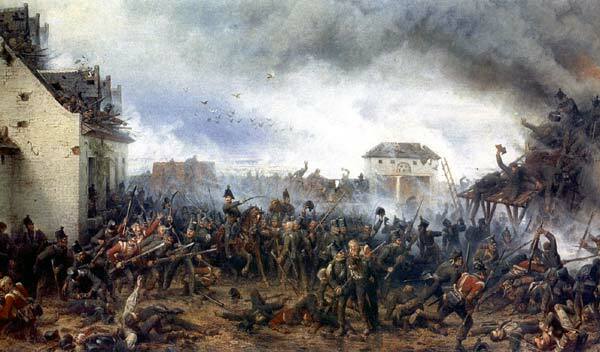 I had a look through the BP when they first came out and they seem quite straight forward, but I stayed away from them as they were not specific to the Napoleonic wars. I follow all the Napoleonic blogs closely and everyone seems to enjoy the BP rules, so I had a look through this morning and they do allow for small units in irregular formation. They also seem to be quite flexible, so I plan to have a closer look. Well, I have taken that closer look, and I believe it will be quite doable with BP. Here are my initial thoughts on the OB and ratings, I am still working on the initial dispositions. I am running some play tests now, to try to figure out how the rules work (thank you Curt of Analogue Hobbies) and if I will require any modifications. At the moment all I have done is decrease the movement ratio to 2/3 in order to slow the play so I can get a better sense of how the rules playout. I am also making some slight adjustments to the terrain. I am thinking that each move is equivalent to 30 minutes and thus planning on a 10 turn game. 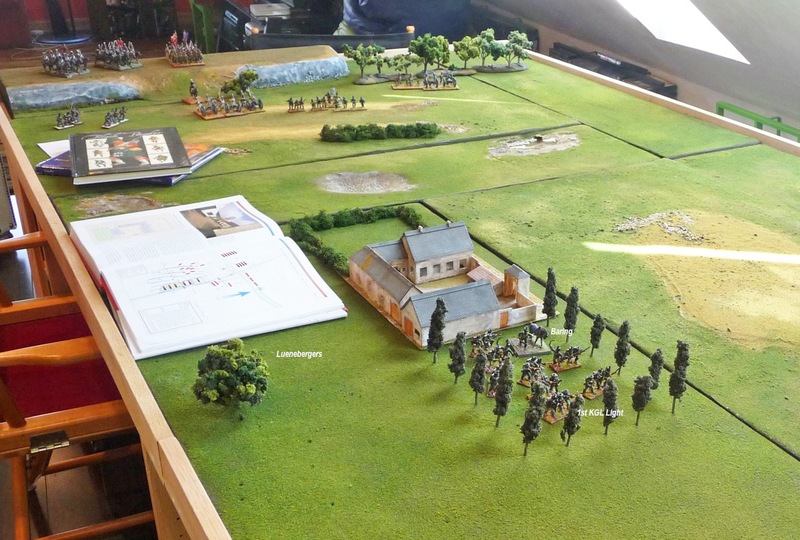 The actual battle took place between around 1400h and 1800h with the French capturing La Haie Sainte, I have added in an extra hour to give the 1700h reinforcements (Gougeon and Ompteda's brigades) some play time. The victor will be who is in procession of La Haie Sainte at 1900h! 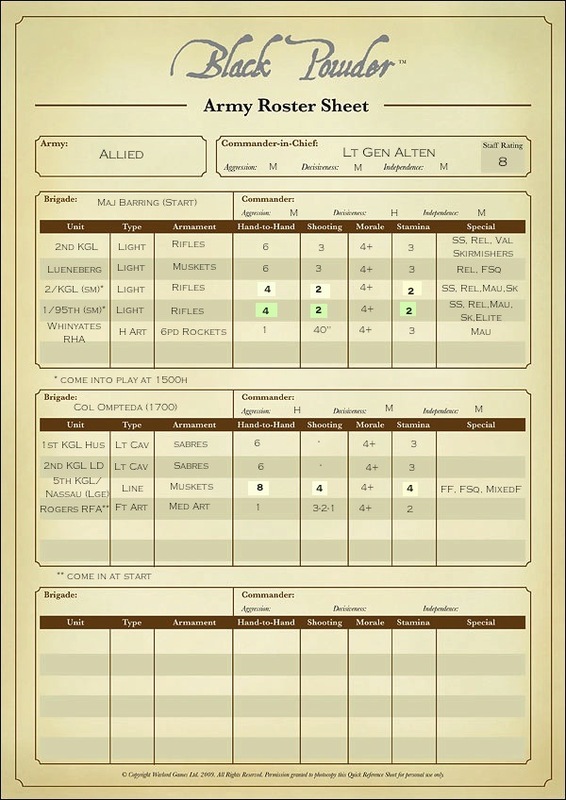 Have a close look at the rooster sheets, I have added a lot of the special rules especially to the Allies to make it more equal and to control for the small independent units. I would appreciate your opinion on the ratings. John: This may seem obvious but I had one question about command throws. Maj Baring wants to give separate orders to all the units under his command. Does he give all the orders and then throw 2D6 and the result affects the whole brigade or does he throw 2xD6 sequentially for each unit after giving orders to each unit? Curt: Unless you are giving a 'Brigade Order' (i.e. units have to start and end within 6" of one another) Baring will have to give orders for (and roll 2D6) for each specific unit. Remember, that if he fails in any of these rolls he forfeits the rest of the Command Phase. For example, if Barring has 3 units that he wishes to give different orders to he will need to decide which one he wants to start with. He declares what the orders are (try to stay away from conditional orders such as "The 2nd will advance, unless..."), determines his modifiers (command distance, etc.) and rolls 2D6. If he fails in his command roll he is done. He cannot roll for any other units in his command. So you will always want to determine where your priorities are as the odds catching up with you increase on each roll. Try the 3 battalion limit and see how it works. 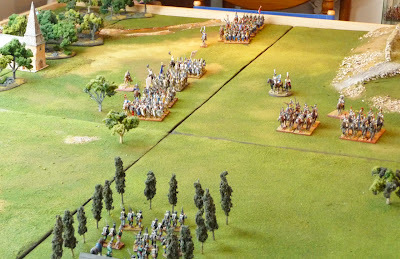 We allowed the three battalions to charge one face of the village as long as they could fit. As a result they formed into attack columns and went in. Either way you will find that the French are going to have a challenging time no matter what as the defending battalion will 'save' any hits on a 2+ and have a +1, +2 or +3 combat result bonus (depending on the size of the 2/KGL). The question then came up when 2 units are attacking 1 unit, do I combine the 2 attackers die? Anyway that is how I did it. There was no closing fire as units in BUA can not perform closing fire. I also here made a couple of command decisions about the rules (it did not take long), the 2/KGL are skirmishers, but I decided not to apply the skirmish penalty for combat as they were in a BUA (maybe I should not have made them skirmishers). I also decided to let the KGL have 4 die rather then 2 as is usual for units fighting in a BUA, as 2 units were attacking(this follows the above questions about the number of units allowed to attack 1 side). Yes, they are considered to be part of the same 'engagement'. 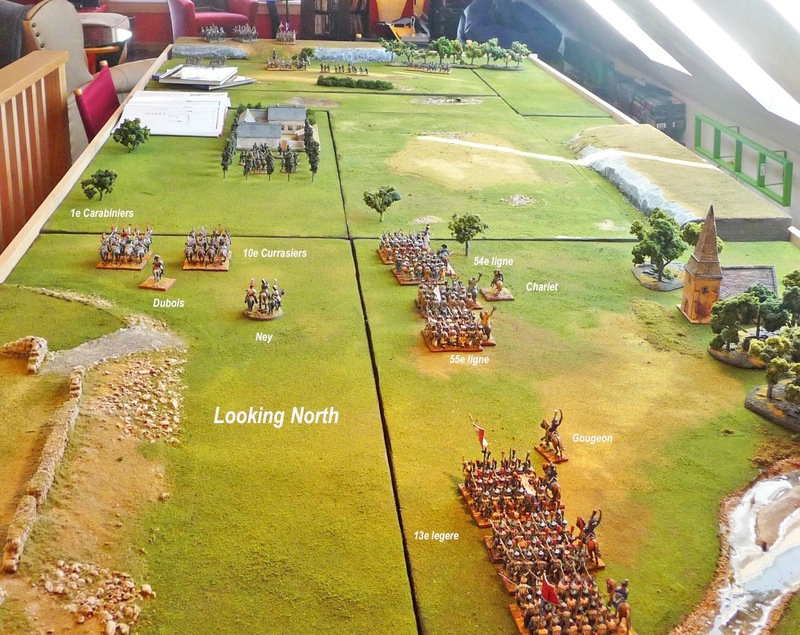 We allow garrison units to give 'closing fire' as they are in a prepared position whereas the rules assume that infantry forming squares (to what the rules often compare fighting in BUA) are too busy trying to get in proper formation to receive cavalry. Picture that these guys are established at loopholed walls and blocked alleyways. Yes, you basically ignore the skirmishing classification. In reality all units in a BUA are in effect in open order or skirmish formation (spread throughout the buildings, alleys, etc.). The 2/KGL should have 2 dice if they are charged on one face. It creates situation where the attacker will want to focus his efforts in one point of attack. We have played a house rule where the defender can call upon more of his h2h factors in subsequent turns to simulate the effect of officers ordering men to shift to defend a at-risk section. KGL throw 4 die, hitting on 4+, they have 3 hits, the 55e save on 2=1 casualty assigned to 1/55e. For my clarification, what are the KGL and 55e saving at? By my understanding the 55e should be saving on a 3+ (base of 4 but with a +1 bonus for being in Attack Column) and the KGL should be saving on a 2+ (base of 4 plus a +2 bonus for defending in a BUA). 1 casualty each, so then I look at the modifiers, +3 for KGL (in BUA) and +2 (2 rear supports) for 55e......the KGL win the combat. As we can see above, the 1/55 passes it break test, but the 2/55e get a 5 on a 2xD6 roll and is forced to retire 2 move segments and become disordered (it has a little pennant next to hit. The 1/54 who were in support pass their break test and this phase come to an end with no further movement. I hope I have it right!! Good, except that the 1/54 would not need to test as the 2/55e did not break (only breaking units require supporting units to check p.71 ). Hmm, so break means lost to action, I was interpreting it as retreating backward. Now if I can check the shooting, the Allies do some movement, Maj Baring actually throws a double6 when activating the 1/KGL and they blunder forward (thus my question about the multiple throws for each separate unit.......also I understand it is only the General who is prevented doing anything after a blunder and that a commander can still carry on). Not exactly, if a subordinate commander blunders it ends his command phase immediately. You can still move on to another commander (or the General) but for the commander that blundered he finished for the turn. A General who blunders forfeits the Command Phase for his entire army. From my first question, so now I understand it, and now I understand why the most important orders should go first! Any on to the firing, as you can see from above it appears that 1 side of the 2/KGL can fire at the 1/55e and another can fire at the carabiniere. The Hanoverians in square can also fire at the Carabiniers. And Lt Dansey with his rockets is within 40" (I used 2/3 distance here as well but maybe the distance of a 6pd rocket is less then a 24pd rocket, I will have to do some research) of disordered 2/55e and decided to fire a couple of rockets (cocky I would say as they could easily land on the 2/KGL in LHS). BTW the rocketeers firing on everything in range seems very much in the spirit! 2/KGL on the carabiniers, they get 2xD6 as from BUA, but this is doubled as the carabiniere are enfiladed, and they score on a 3+ because <4" range= 2 hits (no 6's), 1 save so 1 casualty. 2/KGL on the 1/55e, 2xD6 as from BUA, but score on 3+ because <4" range=1 hit, no saves so 1 casualty (again no 6's).........the 1/55e now has 2 casualties. Again, this should not occur as the 1/55e has not retired from the combat. Yes mistake here, should have been obvious as well! Yes, I quite enjoy rocket fire as its quite crazy. Yes really liked how rockets worked, just have to think about the ranges. It sounds very interesting, unfortunately I don't own BP or RtE, but personally I would have thought RtE would be the better as they are a Napoleonic set, were BP is a set you can use for Napoleonics. We really enjoy BP and I think it will work well for you in this scenario. I used it to depict an assault on a small town in a recent game, incorporating elements of R2E’s ‘Fighting in Built-Up Area’ rules so that the town would have a structural value that could be reduced by the attackers artillery. I gave my village 24 structural points, with reductions in bonuses to the defenders when it reached half strength and again when it was reduced totally. I gave the garrison a small bonus even when the village was completely reduced as I think that rubble would still provide a modicum of defense (i.e. Monte Cassino, Stalingrad, etc.). In regards to ‘feeding in’ reinforcements you could do it a couple ways. One is to simply transfer hits on the garrison unit(s) to the reinforcing unit(s). This would be handled as an ‘order action’ with the reinforcing unit being at least within 12” of the garrison. This is an easy approach but gives advantage to the defender as the ‘hits’ can be removed with rally orders. The other way would be to ‘shrink’ the reinforcing unit to bolster the garrison. 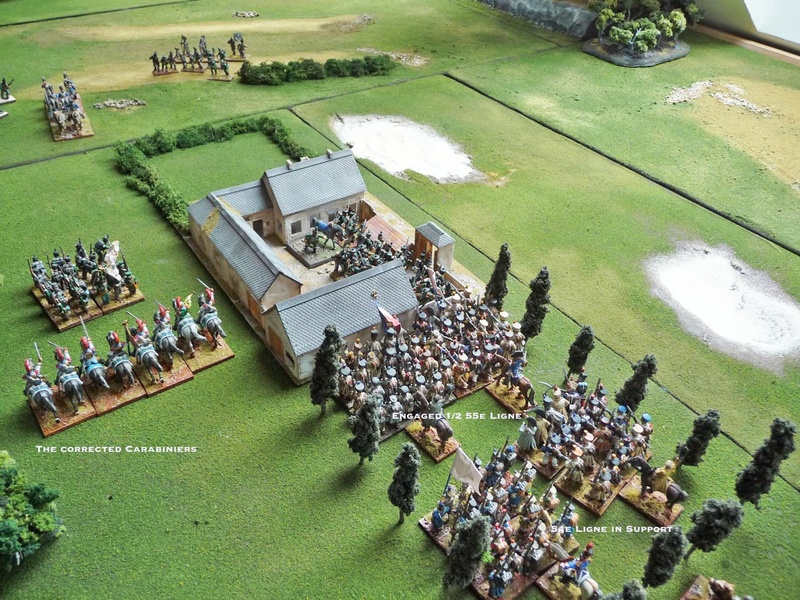 For example, a standard sized unit is garrisoning the village, but has taken 2 hits. A reinforcing unit within range could ‘shrink’ from ‘standard size’ to small in order to remove the hits on the garrison (Again, through a command order). We used a D4 ‘heal’ for each level of reduction. This has a much more material effect on the reinforcing unit which I think may better reflect the situation. For Napoleonic-specific modifications to BP check out the Contemptible Little Wargames Club blog. They have some excellent suggestions to add period-flavour to the rules. I'm not a specialist of BP but I think it can work for what you want to do (options given by Curt may work well). Concerning the ratings, I think you could add one point for the hand-to-hand rating of the carabiniers going from 9 to 10. They were considered as "Elites among elites". Their regiments were also called "The butchers of the army" because of heavy damages they caused to their opponents. I'm not a specialist of British troops so I have no comment here. Looking forward to see the battle. Looks great whatever you decide. 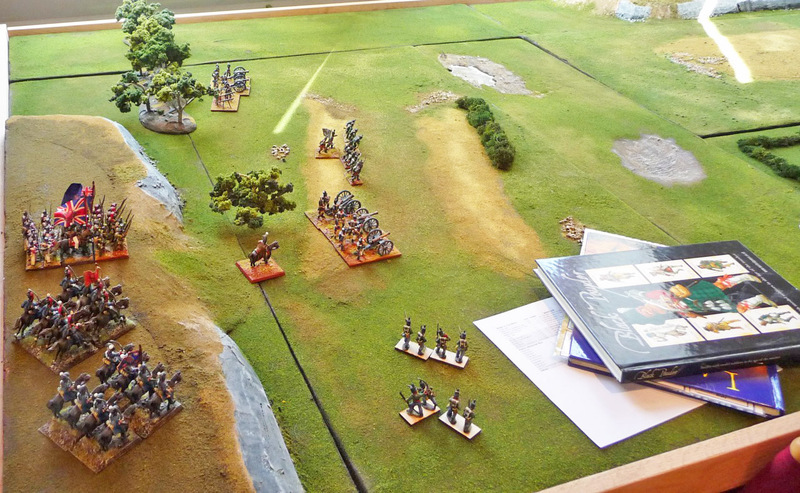 Our club has been very happy with Black Powder so far, in part as we only meet once a month and can play a game to a conclusion. And it's a heckuvalotta fun! I have RtE as well, and quite apart from the visual lusciousness, the rules look good- a different philosophy and flavour from BP, but a steeper learning curve, perhaps. Which is why we haven't got around to trying them yet given the limited time we have available. Horses for courses, and I think both would give a pleasing result for your scenario in different ways. And I agree that Curt's suggestions seem like good ones- well worth a try. A great and inspiring AAR and pictures. Maybe I'll play it with Lasalle some day! 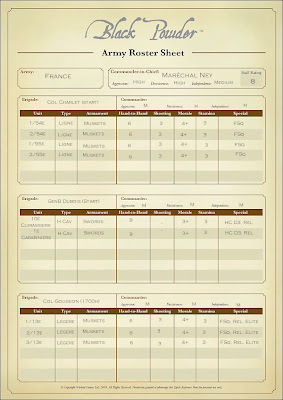 I ve ordered "Black powder" rulebook after reading your AAR about la Haie Sainte. I saw some videos about BP online. These rules are quick and have a system of activation giving suspense, a good thing in a skirmish simulation like la haie sainte. I am playing with a friend "Republic to empire rules" battles for a year, we begin to master it, and i ve made some house rules about it. It s a more complex and historical rule system than BP and Lassalle. But playable when you get master of ot. It s a real gem ! But it needs a great investment. It s more adapted to big battles with many brigades than to small skirmishes. 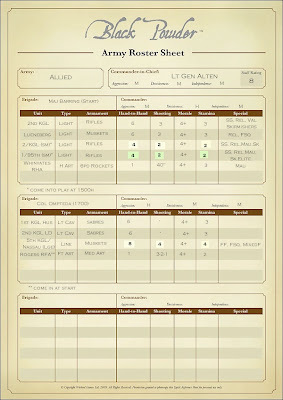 The activation system is focused on maneuvre points gestion and command range. on "la Haie Sainte" situation it would be too predictable, BP with Dice rolling activation give more suspense. But RTE morale test system is great ! It is 1800h at LHS and the the Alllies are still in procession. It has bee a great game, the BP rules worked far better then I expected and it has been a lot of fun. I hope to finish off the game in the next day or 2 and hope to have a report up by the end of this weekend. There will be lots of photos. Very interesting John, abd beautiful set-up as usual. Looking forward to the conclusion. Not sure about R2E played them a few times without any real result (IMHO) they perform an awful lot like Empire 3 and above. (Don’t agree that units firing from a BUA get enfilade fire dice, because the unit is not formed to deliver full volley effect fire)as Curt commented they are spread throughout the BUA so even if engaged in melee they can still fire out an other side - well to me if you follow that logic than they can also be fired upon from different faces and casualties inflicted on them even if engaged on only one face.